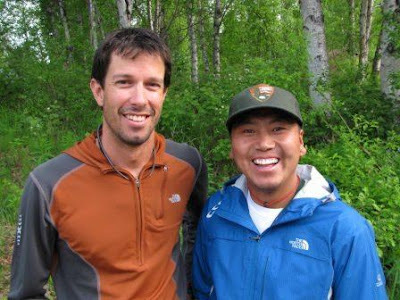 Denali National Park and Preserve’s mountaineering rangers are excited to host volunteer mountaineering ranger PhuNuru Sherpa, a member of the Mt. Everest mountain climbing community and an instructor with the Khumbu Climbing School in Phortse Village, Nepal. With sponsorship from the Alex Lowe Charitable Foundation, 29-year-old PhuNuru is participating in an educational exchange program at both Denali and Mt. Rainier National Parks during the 2009 mountaineering season. At Denali, PhuNuru is serving on a 30-day high mountain ranger patrol on Mt. McKinley that started June 3. Throughout the month, he will be working and training with NPS mountaineering rangers to further develop his technical rope rescue skills and emergency medical response, and in return PhuNuru will share his high altitude Himalayan expertise. Through this mentoring relationship, NPS staff will also provide the opportunity for PhuNuru to enhance his search and rescue leadership skills and learn resource management and ‘clean climbing’ techniques to put to use in a professional capacity back home in the Himalaya. The Alex Lowe Charitable Foundation (ALCF) based in Bozeman, Montana founded the Khumbu Climbing School in 2004 with a mission to improve mountain safety for Nepali climbers and other high altitude workers by encouraging responsible climbing practices. Denali mountaineering ranger Brandon Latham had the opportunity to work with the ALCF in February 2009 by teaching technical rope rescue skills to the Nepali instructors at the Khumbu Climbing School in Phortse. Latham will serve as the lead NPS ranger on PhuNuru’s Mt. McKinley patrol. In early July, PhuNuru Sherpa will head south to continue his educational exchange, joining the mountaineering ranger team at Mt. Rainier National Park and Preserve.